I graduated from the Alberta College of Art and Design with a major in ceramics. In addition to my studio practice I teach a variety of art classes for the City of Calgary. The functional pottery is wheel thrown, using a porcelaneous clay body. Each individual piece is hand painted with a fine grained black slip. My sculptures are assembled from individual components formed on the wheel. 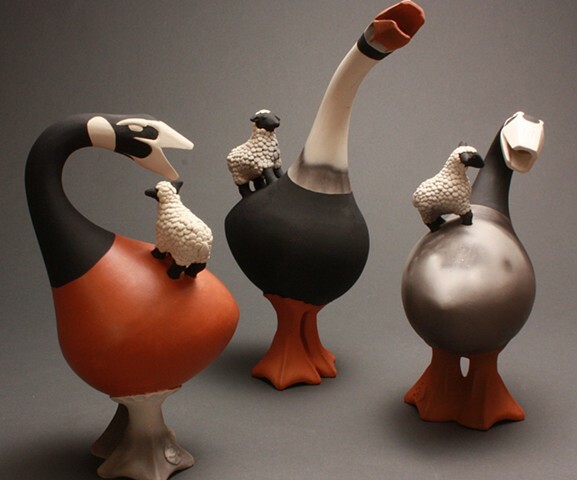 Each goose is decorated using slips to enhance their individual personalities and smoke fired, often several times, to acquire the light touches of carbon on the surface. Why sheep standing on the backs of geese you may ask? Its about their individual personalities and group dynamics. Geese have very strong, almost aggressive personalities where sheep are more timid. Yet in my world, they coexist playfully in the same field. My work has migrated, singly or in flocks to collections in Europe, Asia and across North America.